Explore this famously remote and untouched part of New Zealand by helicopter. Experience flying up close to 2000ft waterfalls, traversing the majestic fiords, dropping in amongst the NZ fur seals, foraging for fresh lobster, hovering over glaciers, landing in the snow for photo memories against the mountain backdrop, and enjoy a gourmet BBQ picnic lunch up on the mountain skyline. This is an unsurpassed experience and unquestionably a highlight of any trip to this region of New Zealand. Visit New Zealand’s highest peak at 12,218 feet (3,724 metres)! A bespoke, private helicopter charter departing the Alpine Lodge and traversing the Main Divide along the iconic Southern Alps, affording some of the most dramatic and breath taking views in New Zealand's Alpine environs. Photo opportunities abound. On landing at Mt Cook airfield guests are transferred to 'Glacier Explorers' for a fascinating glacial encounter, boating on the terminal lake amidst the icebergs. After this incredible experience, board the helicopter again for the return flight back along the western side of the Southern Alps, where the mountains reach their highest elevations, creating majestic sights of this remote and untouched landscape. Lunch is included and your guide will choose a site on the day for you to enjoy your gourmet picnic. Minaret Station is a working high country farm in one of the most remote parts of the country, and home to an impressive number of sheep, deer and cattle raised for the export market. Take a guided 4WD adventure to locate the stockmen and their dogs, and participate in whichever farm activity they are in involved in on the day, be it mustering, shearing or stock work with the deer, cattle or sheep on this 50,000 acre property. NZ fly-fishing has some of the most spectacular and untouched rivers to offer anglers the opportunity to land well-conditioned and trophy class trout. This is sight fishing in its truest form, as the gin-clear snow fed waters require careful stalking of each trout and the intricacies of NZ high country fishing really come into their own. These alpine rivers hold 100% wild rainbow and brown trout and the fish are known for their strength and fight given their cold fast flowing alpine environment. Depending on which side of the divide the fishing takes place, rivers can be either relatively narrow or shallow set within wider glaciated valleys, or overhung with beech forest providing canopies over deeper clear pools. These rivers offer a spectacular landscape in which to spend a day of wilderness fishing! The Matukituki River valley is one of the most spectacular in Mt Aspiring National Park and exploring this by jet boat is a fantastic way to spend a morning or afternoon. Jet boats can operate in four inches of water depth, and the boat trip makes its way up the braided river to position underneath the Avalanche Glacier with views up towards the icefalls. Owned and operated by a local family, this experience includes a bush walk through native Beech forest with informative talks on the historic inhabitants and uses of the valley and bush. Guests will be picked up at the end of the jet boat activity and flown back to the Alpine Lodge with an alpine landing and several photo opportunities on the way. This is the ultimate form of Mountain Biking! 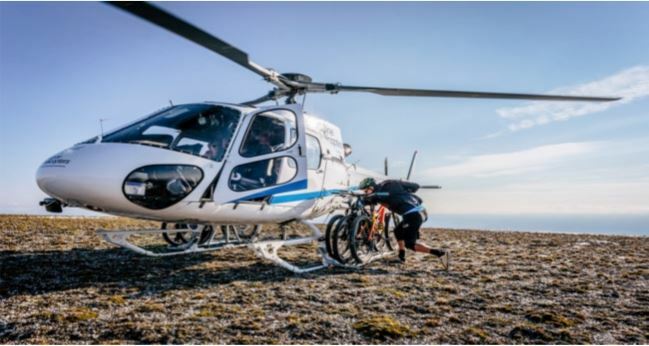 Why ride uphill when you can fly by helicopter to the top and enjoy a thrilling downhill with all the exhilaration you need! After an introduction to the techniques of downhill biking and a gear fitting session with your professional mountain biking guide at the lodge, fly to some of the most scenic parts of the Southern lakes region and launch your epic mountain bike ride down the trails towards the picturesque lake edge below. This is a must for mountain bike enthusiasts! Terrain for riders can be tailored for Beginner, Intermediate or Advanced. Minaret Station offers bespoke guided Heli-Hiking experiences to suit all ages and abilities. West Coast Discovery – Heli Hiking at it’s best! The flight path for this scenic charter is tailored to include hikes to complement guest activity levels with diverse photographic opportunities. Imagine being able to hike along the West Coast beaches, visit the seals, walk up into the Beech forests and getting the opportunity to hike the 'red' mountain. We can include a snow landing for memorable photos against the Mt Aspiring backdrop – magic memories to take home. We provide a guide, and a gourmet picnic lunch to be enjoyed along the way at a spectacular location and with heli hiking the helicopter drops guests with a guide then 'hops' to a pick up point. A great day experience for guests who like to combine some serious activity with a fantastic scenic flight. Stand Up Paddle boarding or kayaking- enjoy beautiful Lake Wanaka from a different perspective! Helicopter flight to the choice of the day location for a unique SUP, or kayaking experience. Lake Wanaka provides several beautiful spots to paddle to for all the family and this activity is a wonderful way to explore the coast line. We provide you with the latest equipment and a qualified water guide so you can get the maximum enjoyment out of your time on the water. Meander through Rolling Meadows at Wanaka’s most picturesque lakeside vineyard on horseback. Rippon Vineyard is Wanaka's oldest pioneering vineyard and arguably central Otago most iconic with its stunning views over Lake Wanaka. Fully guided, this is a great family activity for children or novice riders and a superb way to spend time together. Complimentary wine tasting at the Rippon Vineyard Cellar Door may be enjoyed by adults after riding if requested. Township to the Wanaka Airport for their transfer back to the Alpine Lodge. Helicopter transfer from the Alpine Lodge on Minaret Station to the historic Cardrona Valley for a horse trekking adventure. Head for the hills and a fully guided private tour by horseback. Explore the region’s distinctive landscape, once the home of goldminers now taken over by the tussocks and farmland. Slowly trek upwards to be amazed by the scenery from hilltop vantage points before descending to the valley below where you will be met by your guide for a short drive to the iconic Cardrona Hotel for lunch. A destination on its own with memorabilia from bygone goldmining days to be viewed and enjoyed whilst waiting for your lunch! From lunch to the Cardrona Distillery - our very own Whisky maker – be sure to sample a little tipple before enjoying a scenic drive to Wanaka Airport for your helicopter transfer back to the Alpine Lodge. What could make an evening drink in the mountains more spectacular or memorable? 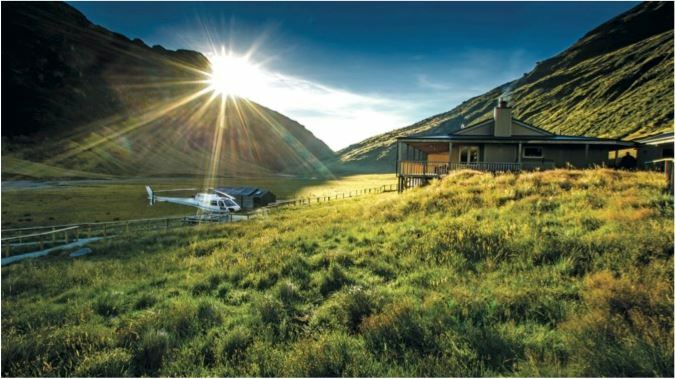 How about taking a helicopter flight from Minaret Station Alpine Lodge, flying above the high mountain ridgelines alongside Mt Aspiring’s huge glacial icefalls and distinctive valleys to find the perfect spot and land. The helicopter will shut off and you can absorb the peaceful alpine landscape that looks out westwards past the glaciers to the setting sun in the Tasman Sea – just perfect! Dress warmly and enjoy champagne or your drink of choice in true style! Why not book an activity for your day of departure for one last great adventure! 1. Branches Station 4WD - depart the Minaret Station Alpine Lodge at 10am Fly across Lake Wanaka and over the Main Divide, dropping into Skippers Canyon to be met by a 4WD vehicle to take you on an exhilarating drive through the Branches station and along the famous Shot over River to Branches Homestead where you will then continue onto Queenstown Airport, or your inner Queenstown accommodation. 2. Wild Wire Adventures (Via Ferrata) - depart the Minaret Station Alpine Lodge at 10am This is New Zealand’s only waterfall climb and Wanaka’s newest adventure. Participants will learn safety skills and then begin their climb alongside a spectacular waterfall on the Via Ferrata. They will climb ladder rungs, cross wire bridges, encounter hidden pools and discover beautiful picnic spots with stunning views. The descent is by trail with great views back towards Wanaka. If you can climb a ladder you can do this! No previous experience is needed. Guests will be met by their private luxury vehicle to be transferred onto Queenstown Airport, or your inner Queenstown accommodation. 3. Wine Tour via Bannockburn - depart the Minaret Station Alpine Lodge at 10am Helicopter flight from Minaret Station Alpine Lodge to Bannockburn, Central Otago a small historic gold mining town with a uniquely warm, dry climate which earned it the name 'The heart of the desert'. These climatic conditions make Bannockburn ideal for many well-known vineyards and stone fruit orchards. Here you will be met by a luxury vehicle that will take you through vineyards around the Central Otago area, and onwards to Queenstown. A lunch stop can be included at guest’s own expense. Fly across Lake Wanaka to the stunning Matukituki Valley and meet New Zealand's premier canyon guiding company. Highly professional and committed to safety, participants are assured an exciting adventure. Descend the spectacular canyons of the Matukituki valley that are considered world class, deep with fantastic water features. Explore your way through crystal pools and native forest. Plunge down water polished chutes, abseil down waterfalls. Climb, swim and float through a spectacular world of water-sculpted rock and sparkling, crashing waterfalls. Guests will be met with their private luxury vehicle to be transferred onto Queenstown Airport, or your inner Queenstown accommodation.